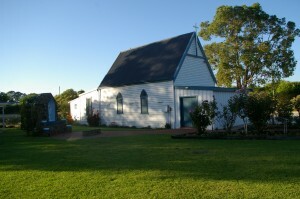 St. Louis Church in Boyanup was built by faith, hardwork and zealous dedication of a small group of Catholics led by Terence and Brfidget Reilly. The Church as Dardanup was “too far away” for thee Catholic pioneers in the early 1900s. Occasionally a priest would stay overnight with the Reilly family to celebrate mass in ther front room, tha altar made from kerosene boxes. This small gorup f Catholics, kneeling at their humble altar, had one desire – to raise funds for their cause. Terrence trudged through the district door – knocking. One generous parishoner fave five pounds, :a fortune in those days”, and for every pound raised Terence and Bridget matched with a pound of their own money. their was a tue sacrafice as tjeu jad nine children to feed and clothe. The women made cakes and jam and refffled dressed chickens, while their children would sell raffle tickets around the small community. their efforts were realised when local builders, Alfred Peake and his son Frank, were engaged to build the Church. Sawn timber was hauled by horse and dray from the old Argyle mill between Boyanup and Donnybrook by the Reilly boys, and with willing assistance of those few pioneers the Church was built. St Louis was named by Dean Luigi Martelli who was born in India of European descent. He arrived in Australia in November 1881, and came to the Parish of Bunbury in 1897. Dean Martelli acted as agent for the Sisters of Mercy, buying lands for future convents . He insisted the Church be built on freehold land with enough space to build a future convent and so the present site was purchased. The land previously gazetted for the Catholic Church on the South West Highway was later sold to the local garage owner A.G. Hitchings to expand his business. In Novermber 1989 a portion of the land intended for the convent was sold to the Capel Shire by Bishop Quinn for the sole purpose of funding the construction of aged accommodation. “Riverside Villas” for the aged were opened on 16th October 1993. For a time in 1908 St Louis was administered from Bunbury. Priests would travel by rail to Boyanup Junction on Saturday evenings and sleep in the sacristy, saying 1st Mass at St Louis. After mass the Reilly boys would take him by horse and cart to Donnybrook for the 2nd mass. On Monday the priest would return to Bunbury by rail. In 1923 Rev Father James O’Grady became parish priest of Dardanup. He travels the six miles to Boyanup in his horse and buggy at “break neck speed”. Later, when he acquired a motor vehicle, it was still a “hair raising journey” expecially for the Sisters of Mercy who accompanied him. Archbishop Prendiville, visitng Boyanup after the blessing and dedication of Dardanup in May 1938, was horrified at the condition of St Louis and ordered the Church to be lined and sealed. In his opinion “it wasn’t fit to say mass in”. The upgrading was completed by 1940. Rev. Father Charles Cunningham (later Monsignor) cam to Dardanup as Parish Priest in 1948, and it was during this period of time that the stone fence at the front of the Church as Boyanup was erected. In July 1968 Monsignor Giles has the small porch replacedand a new Altar built to enable the celebrant to face the congregation in line with the changes made by the Second Vatican Council at that time. The confessional was also built at that time. In May 1990 the outside stimps were renewed and the confessional removed to provide extra seating. A new altar, tabernacle and side shelving, designed and made by Michael Rubie, were installed. The floor of the Church prior to the present carpet being laid, was polished boards. Very few alterations have been made. Today the Church is structurally the same as when that small band of Catholic pioneers witnessed the blessing and dedication of St Louis Church in 1913.